Few things are more jarring than having a tire blowout while driving. A tire blowout could result in your vehicle crashing or flipping over. Although the incidence of tire blowouts is decreasing because newer vehicles are now required to have tire pressure monitoring systems, tire blowouts are still a major concern for drivers. 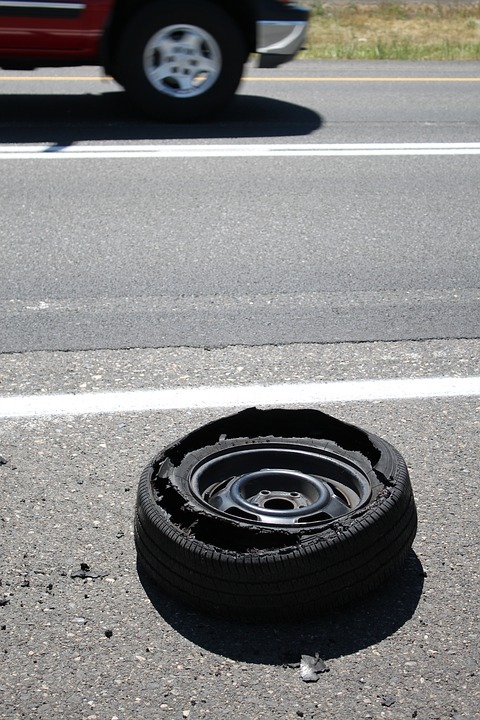 Most drivers are ill-prepared to handle a tire blowout. In the heat of the moment, they may be unsure of how to react and may panic. Drivers should remember to stay calm and take control of the vehicle that will most likely swerve in the direction of where the blowout occurs. If the right front tire blows out, for example, be prepared for your car to pull toward the right. You will know that you have a tire blowout when you hear a tire exploding and feel your car pulling in one direction. You may also hear the hissing sound of air escaping from the blown out tire. When a blowout happens, look straight ahead and keep your steering wheel pointed straight, no matter how hard the car pulls in one direction or another. You will notice that the side of the car where the blowout occurs will be lower than the other. Do not step on the brake, as this could result in your car spinning. The momentum of the vehicle will keep it moving, although your speed will be greatly reduced because of the drag of the blown tire. Once you keep your car under control, ease up as you gradually slow down. If the car is not slowing down, apply a little bit of brake pressure. Slowly and carefully veer to the side where the blowout occurred. Do not turn the steering wheel sharply. Turn it very gradually until you can get out of traffic and inspect your tires. The best precautions against a tire blowout are to maintain your tires well and check their tread and pressure regularly.